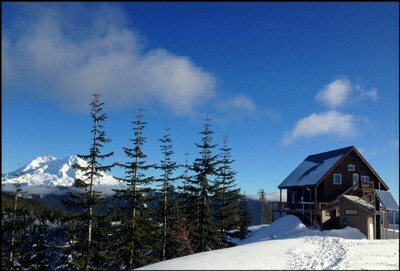 Snow Bowl and High Hut ski trip at Mount Tahoma Trails. Depending on the snow level, the trail is generally icy from the snow park up about .5 mile up (beyond Anderson Lake cut off). Although the distance is the same to High Hut or Snow Bowl, the trail to High Hut is more gradual and wider therefore easier to ski down.